As it names suggests Power Plant is a strong, robust cannabis strain, an F1 Hybrid of South African descent. Power Plant Primo Feminized Marijuana Seeds by Sensible Seeds Premium Selection: As it names suggests Power Plant is a strong, robust cannabis strain, an F1 Hybrid of South African descent. This beast has stood the test of time and is still one of the best sellers since its birth in the 90's. 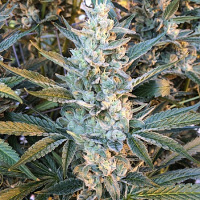 A fast flowering sativa and an ideal choice for beginners, she will typically produce 3 to 4 main buds though if pruned she will produce multiple buds. She has the perfect flower to leaf ratio making the manicuring a smooth process. Buds will be tight, compact and heavy and will be a light jade to dark emerald in appearance, and the sharp 7 pointed shaped leaves will be even darker. The dark greens make a good backdrop to show off the shiny THC crystals. Suitable for most indoor setups and outdoors in sunnier locations, ideal for sea of green or screen of green setups, the smell can be overwhelming sometimes so decent odour control is a must. Quick to flower and bumper yields make this a great choice for the commercial grower or connoisseurs alike a good choice for the MMJ user, especially for depression or stress. 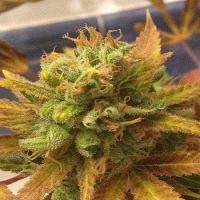 Power Plant has a piney, peppery taste with a hint of lemon. The "Power" comes from its extreme effects when smoked. If you have a day time job and want to keep it then smoke only after work or you will never make it there. Small tokes only are needed for a good clear headed high overdo it and your mind will be lost in the clouds... You have been warned!